Right now, the Dock is probably sitting at the bottom of your screen, showing you applications, a couple of folders, and your Mac’s trusty Trash. (Then again, it may be hidden, or stretch along the side of your screen; see this article to learn how to customize the Dock.) Most Mac users know the basics of using this OS X tool, but what you may not realize is that the Dock offers powerful and convenient ways to access the files and folders you work with most often. Start by adding folders you use often to the Dock. If you’ve kept the Dock’s default setup, you’ll see three folders in its right-hand section: your Applications, Documents, and Downloads folder. Apple put them in such a prominent position to save you time. Still, you may not want to have all three of them there. Files and folders sit on the right side of the Dock, next to the Trash. 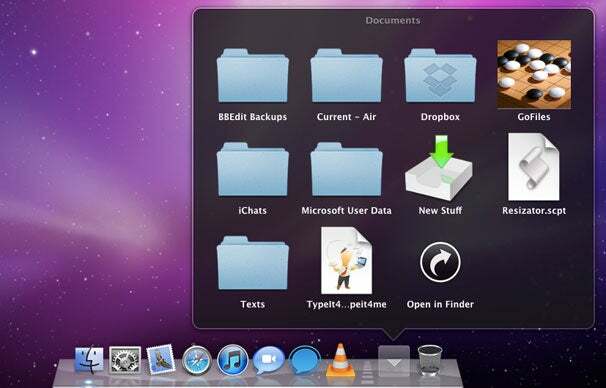 Customize this area to get easy access to the files and folders you're currently using the most. When you're done with something, just drag it off the Dock. Folders are nice, but if you have a bunch of them in your Dock it can be hard to see at a glance which is which. After you’ve put a folder in the Dock, hold down the Control key (or press your right mouse button, or use a trackpad’s secondary click gesture), and click on the folder to show a settings menu. These settings affect how the folder is displayed. Choose Show As Stack and instead of an icon you’ll see the first item in the folder, with the edges of others behind it. This can be especially helpful if you choose to sort the contents by Date Added; when you add a new item, it will be on top. For example, with your Downloads folder, you’ll see when new items arrive. Fan Choose this option and when you click on your folder its contents will “fan” up in an arc. This is a good option if you only have a few items in the folder or stack; otherwise, you may have to click on a “More in Finder” button to see the rest of the items. You can use the Up- and Down-, or Left- and Right-arrow keys to move through the fan. Grid This shows all the icons that can fit on your screen, and includes scrollbars, when necessary, so you can scroll down to see additional items. In Grid view, you can use your keyboard to select items. For example, if you have your Applications folder set up to display in Grid view, click on its icon, then type “SAF” to select Safari, type “M” to select the first application whose name begins with “M,” and so on. Just press Return to launch the selected application. You can also use arrow keys to navigate in Grid view. List This is a compact list of items in the folder or stack. The thumbnail image is small and only shows each item’s file type—not an image of the file’s contents. Typing letters to select items works in this view as well. Automatic This option is the default. It displays Fan view when there up to nine items in a folder or stack, and Grid view if there are ten or more. After you press return, a new stack will appear in your Dock. It will show recently used applications by default. Control-click on it to change what it displays, for example, Recent Applications, Documents, or Servers. With the Recent Items stack, you can display—and quickly access—the documents, applications or servers you've used recently. You’ll also see two more items in this menu—Favorite Items and Volumes. Favorite Items are the folders found in the Places section of your Finder sidebar. (Select any folder and press Command-T to add it to the Finder sidebar; hold down the Command key and drag it from the sidebar to remove it.) Favorite network volumes are the ones you’ve added as favorites in the Finder’s Go -> Connect To Server dialog box. As a bonus, you can run the above Terminal command again, and get another Recent Items stack (or folder). That way you can set up multiple groups of recent items to access as you wish. With these tips you can turn your Dock into a powerful organizational tool, presenting much more than just the handful of applications you use regularly.